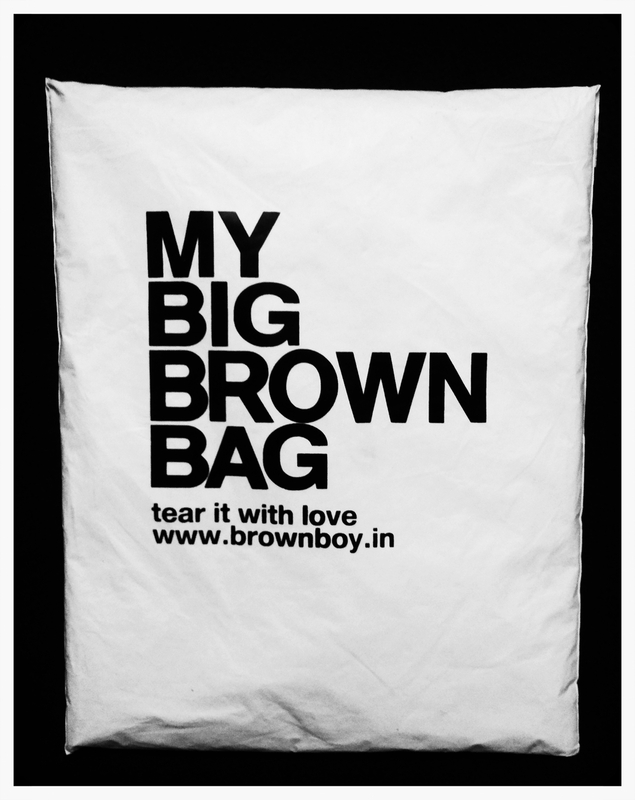 Brand Review: BrownBoy - Organic Tees for Men — Image Consultant & Fashion Stylist for Men in India-I am Mr. There are lot of men who are not a round-neck tee person, primarily the reason being that it makes them feel “hanged till death”. Recently we decided to take a call on that and check if there are brands who can help change that mediocre scary notions of men. We have been looking at lot of brands lately, but as experimental and passion oriented as we are, we wanted to hit the non-conventional brands. We chose BrownBoy. Yes, that’s a brand. First things first, it is a dynamic brand with a niche collection and a genuine customer-care response, personally from the owner – Mr. Prateek Kayan. Mr. Prateek is neither a fashion designer nor a designer in any way but a passion-driven individual to provide top-class organic t-shirts to us, men. Having ordered two of their classy tees, one plain and other nautical stripes from their two different segments, it was amazing to see how similar the tees were in terms of fabrics yet differed distinctively in terms of fit. Not to boast and be as modest as one should, these tees were the best ones we have seen recently. Fabric as soft as baby-skin and fit as good as a bespoke tailoring, the product is truly a master-piece. So what is so genuinely beautiful about BrownBoy you may ask? These tees are a piece of art, well curated and crafted. Limited collection yet none to say NO for. Fabrics sourced from some of the best mills in India and abroad, the fabric is truly organic. These eco-friendly tees do not harm the skin unlike most dyes that could cause rashes and itching moreover these tees are made using the best recyclable materials and dyes. Getting to the fit part. Fits just apt. Normally in an online delivery, one is skeptical about the shoulders and neck area but surprisingly, these tees fit just too well even though coming in generic sizes like S, M & L. But as the organic fabric is too soft and smooth, it takes the shape of your body instantly. For someone with a beer belly or fat, these tees are apt investment to get your body in shape. Personally, inspired by European high-street fashion, the best part is the length vs size – taken care in the best possible way. Yes that's right. Not only that the fabric is smooth and soft but the tee has no itchy brand-tags of wash-care labels making it all the more genuine and comfortable to wear. Usually such tags and labels over a constant wear-n-tear and washing gets stiff and starts to give a discomforting itchy feel, which in the case of BrownBoy is completely avoided. INTERVIEW WITH MR. PRATEEK KAYAN. 1. Brown Boy, it’s an interesting name for a brand and common reference for an Indian men, how did you arrive to this name? Firstly the word Brown has got nothing to do with any particular race or color of skin. However I do understand that people can tend to relate the word to South Asian skin color and more so because our Brand is based out of India. However Brown Boy is a Global brand and that's how I have always treated it. So there is absolutely no co-relation. We do stock with a few boutiques overseas and have clients there; nobody has ever co-related Brown with color of ones' skin there. Anyway it's actually interesting how the name came up. And it just shows it was meant to happen. Brown & Boy were parts of two different names I had scribbled on a paper. That's when I was trying to come up with a name and was writing down words all over a page. So these two words were lying next to each other...it's like fate brought them together. And once I read them together I just felt this rush of excitement and I knew this is what it should be. A very positive gut feeling. No looking back since then. 2. Organic is a vague term, can you explain a bit in detail where exactly it fits in the Brown Boy tees? Cotton is the most chemical/pesticide consuming crop. We all know its harmful for the planet but as this chemical eventually makes way to us it's bad for our skin too. Organic cotton on the other hand is cultivated using natural manures and within strict regulations. No chemicals are used to grow Organic Cotton. Now although really expensive to grow and labor intensive, I believe it's all worth it. It's softer, healthier for you and the environment...and lasts longer. So paying a little extra is absolutely okay for this. 3. Your tees are amazing, but any particular reason to not use “Brown Boy’s” for the campaign but a “White Boy”? Firstly the way we do shoots is very non-traditional. Because we don't have funds for a shoot, I ask my friends to model and I photograph. Now I don't request them on the basis of their skin color...but on how aesthetically good looking they are, their personality and comfort level with the camera. Now if I personally know anyone who would be interesting to shoot, I would ask them (despite the color of their skin). For example I have asked a friend in the US to pose for our AW collection, he is African American...just saying. It's really how one would look in pictures. Secondly as I said Brown Boy is a global brand. That's how it's always been. Now if we don't correlate the word with the color this question would never arise. 4. What’s the future for organic garments? What’s next in the catalog of Brown Boy? I strongly believe once you wear Organic garments you wouldn't go back to wearing regular fabrics. So it's definitely a bright prospect. I have just completed designing the AW 15 collection. It's really amazing...very New York I would say. I love NY and the city really inspires me. A lot of Brown Boy is New York. 5. You have a smart WhatsApp DP, what’s your daily dress-style like? And I undoubtedly love fashion, design and good clothes....I wouldn't leave my job in NYC to get into this otherwise. Presently my daily wear is pretty casual. Clothes exude a person’s personality and aura. It should look very presentable especially at work. Full sleeves shirts (sleeves folded really high) and well fitted bottoms. A commanding pair of shoes. No accessories...however I would suggest one should wear a simple vintage/old watch with leather strap. 6. Now the ball is in our court, what do you think about “www.iammr.in “ ? It's like doing a good deed...we may deny it but we do live in a very judgmental and superficial world and hence it’s important to present oneself well and I suppose that's where you help a lot of people. Moreover it's interesting to see such a website function in India...and people responding to it well. "Honestly, it is one of the best soft-feel tee I have seen or worn in a recent time. No doubt GQ INDIA had to recommend and use it for their shoots. But one thing that I would want to put it upfront is, if you are someone with a belly and fat, this tee would first want to you to loose those extra chubbiness. So from my side i would surely recommend BrownBoy to the readers and help them change their perception towards round-neck tees."